This is the sharpest folding blade I own. The scissors can cut anything. The saw is amazingly sharp. 2017 UPDATE: I ordered the pocket clip from Leathman for approx $13 CDN. It's a really great addition to this tool. It's almost as long as the tool itself, and holds the tool very securely in your pocket. I have been carrying this multitool for 2 1/2 years. If I am camping, fishing, or hiking, it's always on my belt. If I'm at home, it sits in the junk drawer in my kitchen. I use it for everything. I use it to cut hard plastic packaging, cardboard, and paper. The different screwdriver bits come in handy and i often use it instead of walking downstairs to grab a screwdriver out of my tool box. The scissors are extremely sharp. It has a lanyard loop, so when I am in my canoe, I have it tied to my belt with a piece of paracord. The leather sheath that came with it is great. The tool fits perfectly when it is folded, or when it's opened into a pair of pliers. I've cut a lot of heavy gauge baling type wire and the wire cutters still work great. Of all the knives I own, the only blade that is sharper than my leatherman blade is my filleting knife. My opinion of a multi-tool is that it's meant to be used for everything. I don't go a week without pulling my Leatherman out and using it, and after 2 1/2 years it's not worn out. Everything still works as well as the day I got it. I don't use the saw very often. I'm not really sure when I would need a very small saw. I would have preferred having a small hack saw. I can think of many times when I wanted to saw off a bolt head or a nut or saw down a broken piece of hard plastic on a piece of kit. The only other thing I don't like is the weight. This thing is heavy. However, I'll lug it around everywhere because it always performs well when I need it. I'd ask Leatherman to design a Wave that is made of lighter materials, but if they did that, I probably wouldn't pay the extremely high price that I'm sure would go along with it. This multi-tool has replaced every folding knife I have ever owned. Not only is it equipped with both, straight and serrated cutting blades, but both are designed for one-handed opening and are very strong. In addition it has a separate saw blade and file good for wood, plastic, and metal. 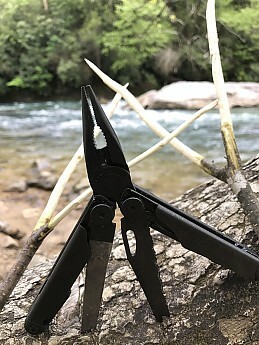 Compared to the Gerber Flik and the S.O.G power lock I have found this tool to be superior in that the arrangement of the blades are more applicable to the situations of outdoor use. Every blade and tool has a locking mechanism. Made of high tempered stainless steel that holds an edge for a long time. Pocket clip can be a little too tight upon retrieval. Blade nuts can be somewhat tight. Extremely hard to clean when soiled with dirt. I never leave the house without this tool. I picked it up about six months ago and it has become my everyday carrying knife ever since. I had to order the pocket clip separately from the Leatherman website but, it was every bit worth the expense. I've used this tool at home, at work, and especially on the trail. 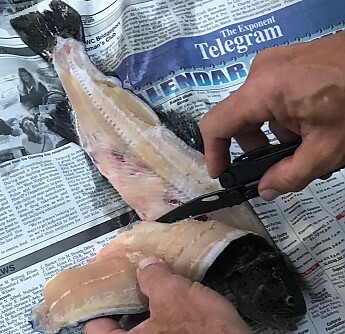 It has more than exceeded my expectations numerous times while sawing down small trees for firewood and feathering starting strips, repairing broken gear, and even cleaning smaller game fish. With 17 tools compacted into a 4 in. by 1.25 in collapsible frame, the Wave is an arsenal of survival equipment. 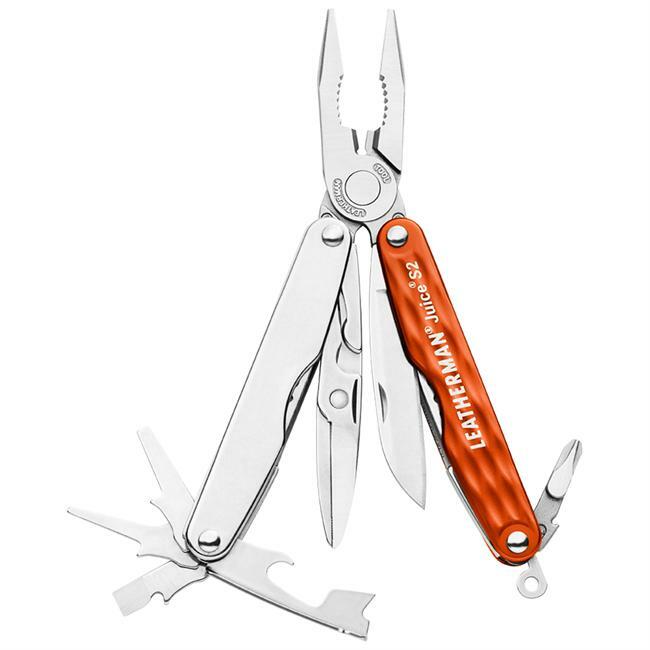 Leatherman hits a home run with its New WAVE Multi-Tool. 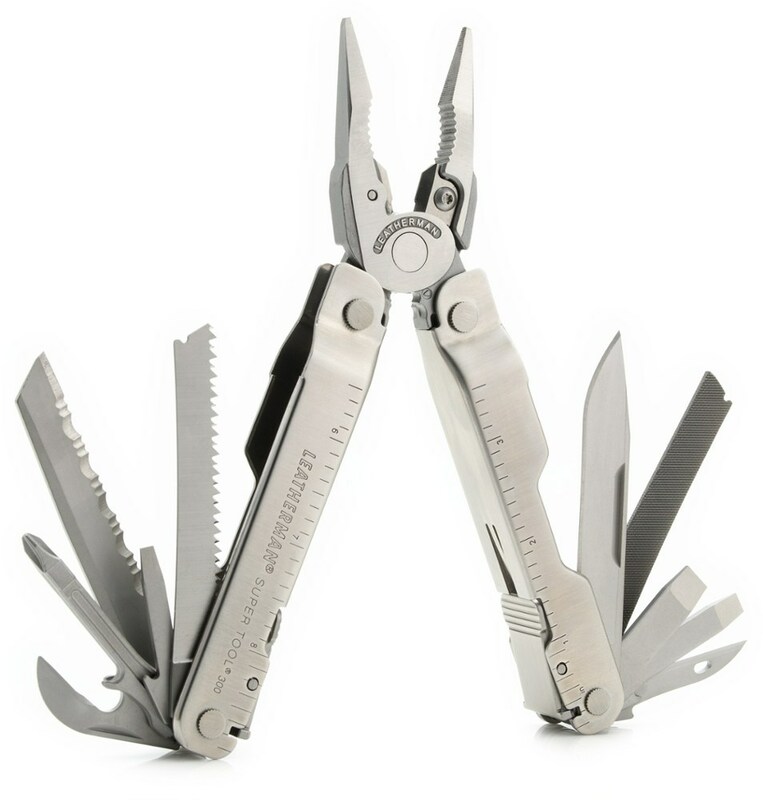 Leatherman hits a home run with its New WAVE Multi-Tool. Durability, reliability, and strength wrapped up in a small handheld tool. The New Wave by Leatherman is a great choice to keep on your belt or backpack, for all your outdoor adventures. My kids gave me an Original Leatherman multi-tool back in '91 and it has remained an integral piece of my duty rig ever since. Most find it hard to believe that old leather pouch has hung in there all these years, yet after nearly three decades of rugged use, they both look pretty good and function flawlessly. 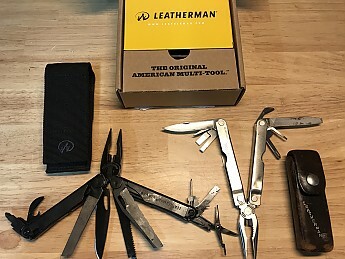 From time to time, I'm invited and honored to test and evaluate gear, so when another website asked me to review the New Wave by Leatherman...I was anxious to get my hands on it. I spent 50 days camping and hiking this spring, so the New Wave was strapped to my pack and I put it through its paces. The first improvement was the solid nylon web pouch, ample hook-n-loop closure, and a nylon web snap with cross-straps to allow securing it to a wide size range of belts or straps. A good tool is only useful if you don't lose it. I chose the matte black finish rather than the shiny polished stainless. The upside: when used for tactical reasons, the subdued coloration does not glint or draw attention (a definite positive). The downside: when used out on the trails, at times it was difficult to locate at night even with a flashlight outside its sheath. The blades are razor sharp, as expected...and kept a good edge. Oftentimes, I found myself using three of the blades on the same "project," which was convenient and more effective. The time proven liner lock for the blades is secure, trustworthy, and a great addition. The pliers, are, well...pliers. Effective and used for various tasks. 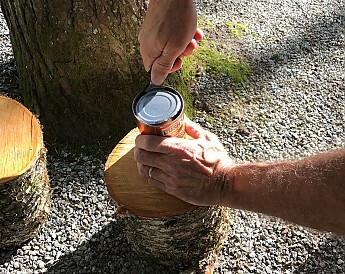 I grabbed many a hot can of beans off the fire with them. They have a very positive grip...and the wire cutter surface area is longer. I listed the "drop-in" tool bits as both a positive and a negative. I do like the versatility, ease of reversing driver bits, all the while, reducing space used. The additional driver bits that you can purchase separately, just don't get me excited. I'm certain I'd lose them, that's why I added them to the "con" list. Others may not love them...I'm into easy. The locking mechanism for the New Wave tools is also very positive and secure. Simply press the tab and it releases the lock to fold the tool. Not mentioning any brand names, but one certain well known company uses a "nylon" sliding lock for their tools, which I have had break and jettison off (read:lost). Some people don't like scissors on their multi-tools...I do. Perhaps as a result of all the fish and beans, my Mountain Khaki waistband button jettisoned off. 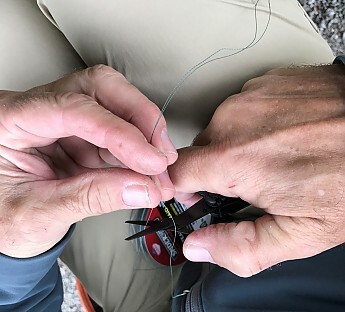 Fortunately, I was able to use some braided fishing line to reattach them, without doffing them (it was cold), which is exactly why I like and used scissors rather than a razor sharp knife blade when trimming excess. My Pop always told me, "son, buy the best you can...buy once." I have relied on that advice and it has served me well. Thanks for the review and pictures, CY6! Clearly a multitool fit for the gods. This phenomenal tool, clearly of Asgardian ancestry, has been sitting on the right hand side of my belt since 2007. It has been everywhere with me (from Haiti, to Virginia, to the Yukon), and done every task I threw at it (from cleaning weapons to cutting helipads). Only when I went significantly above and beyond what I should have done with it did I start to think that maybe I should use something else (which of course is the problem, as the Wave inspires such confidence in its user that you use it for things you shouldn't have). I'll mention what I broke now to get it out of the way, both were my fault and I haven't really bothered to fix them yet. First thing was the small screwdriver with the very long thin bit. I was cleaning carbon off my rifle when I managed to snap the bit in half when I was reaching into a tight corner. Second, I was getting ready for a helicopter pickup, cutting down some trees and all we had was two Waves and one machete. The Waves were working great (much faster than the machete for the small trees for whatever reason) and again the tool inspired a reckless amount of confidence that the little saw blade would be able to fell a tree six inches in diameter. It did. The blade is now bend quite badly so that I have to force is back into shape to close it again. The uses for the Wave are near limitless, and you find yourself using it for things that it definitely wasn't designed to do, but it does them damned well anyways. Product is great. However the company has no costumer service skills at all. First, product is probably the best. However the company is the worst. They have a long way to go in the costumer service area. I ordered my Leatherman with engraving. When it arrived there was no engraving, so I contacted the company and they just wanted to refund the engraving cost. I was like, "no, I want the engraving." So they arranged to send it back. I think OK, not so bad, but then the fun begins. It gets back to them and a week goes by, no contact. I tracked the item so I knew they had it. I call them and they say it will be a couple days and it will ship back. Two weeks go by and nothing. So I call again I was working with Breeyn N Nelson who doesn't respond to emails ever. I have sent this person four emails with not one reply. I get told that well instead of engraving my item they just refunded me my money. I am pissed at this point cause now it's been three weeks and I still don't have the item I want and they decided, I guess, that I didn't want it and gave me a refund. I ask for a manager. I get a person named Cameron who says to replace the order and email him the order and he will take care of it and overnight the item to me. Well guess what, I place the order, email him with a copy of the order, and I leave him a voice message asking him to make sure it gets engraved. Well a week goes by, I look online, I get standard shipping 5 to 7 days. It says shipped, no tracking number, and still no item. This place really needs to get it together. Having a great product only goes so far. There is a costumer service to things. I will not ever order from them again. Welcome to Trailspace, Dallas. This sounds like a very frustrating experience. Did the tool ever show up engraved? Absolutely the best multi-tool on the market! I had the original model and loved it as a leader in Boy Scouts. I had the ability to buy a newer version (all the same functionality) so threw the first model into the glovebox. I decided to give each of my two boys the newer model when they received their "Arrow of Light" crossing over to Boy Scouts from Webelos. Six years later, every person's Wave is working perfectly. 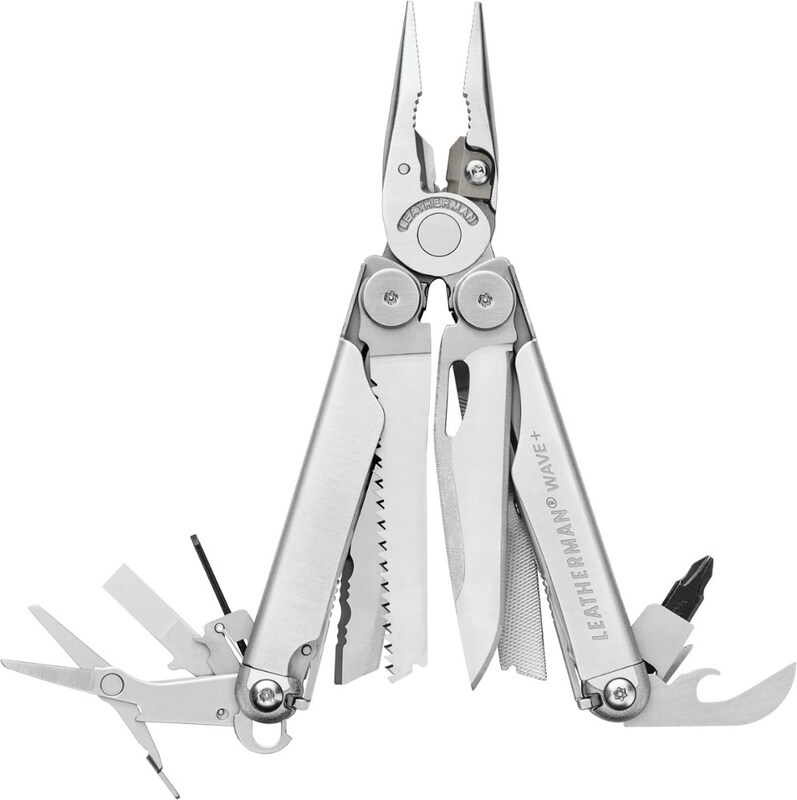 I am now a quite collector of other models of Leatherman multi-tools. Nothing, and I mean this with great experience and tool-in-hand-time, no other tool comes close. This is durable, functional, and a necessity when we are camping. The tools are top quality and the knife blades are sharp. I use this tool often and have yet to sharpen the knife blade in the last 5 years. The tool functions as you would expect. I keep this in my camping gear, and when not camping it rides in the console of my jeep. I have had this over 5 years now and all the moving parts open easily as when new. This feels bullet proof. I know I have torqued on the pliers and everything was solid. I have used this to work on my vehicle, making a camp site, cutting rope, repairing gear, and even around the house, it is just handy. 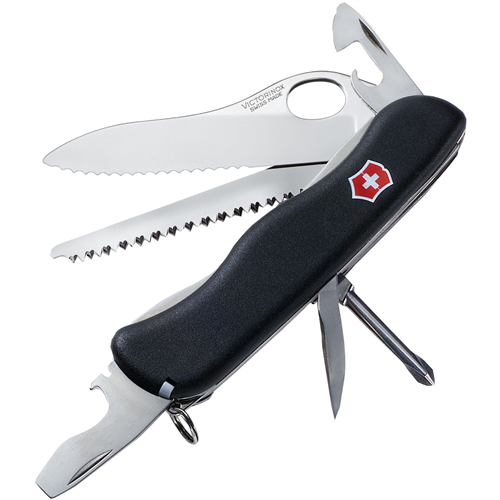 We also have smaller versions with fewer features that are handy to have around as one would carry a pocket knife. I would recommend this for anyone who is out and about often. The only time I leave my Leatherman at home is when I fly. And that is just because of the TSA. I have never had a tool that is used on a daily basis. These are great. I work outside in all weather conditions and have never had a problem with my Leatherman. I have all the tools I use for work in one easy to carry and use tool. To be honest I feel naked without my Leatherman. I got this as a groomsman gift in my friend's wedding. I got this as a groomsman gift in my friend's wedding. I use it everyday, probably 15-20 times at work and around the house. I take it fishing in saltwater and fresh, and use it as a backup tool on the motorcycle. All I can say is, I'm VERY impressed with how well it has held up and how useful it is. It is a bit "difficult" to sharpen, it's a very hard grade of stainless, but it will keep an edge for quite a while. The pliers are handy for holding small objects, or removing hooks, and the wire cutters work quite well, except for very light wire/line and multistrand cable, but they're not designed for that so I won't hold it against it. So far it has not shown the first sign of rust or breakage at all and I've had it for almost 3 years now. This is the the best muliti-tool ever made. 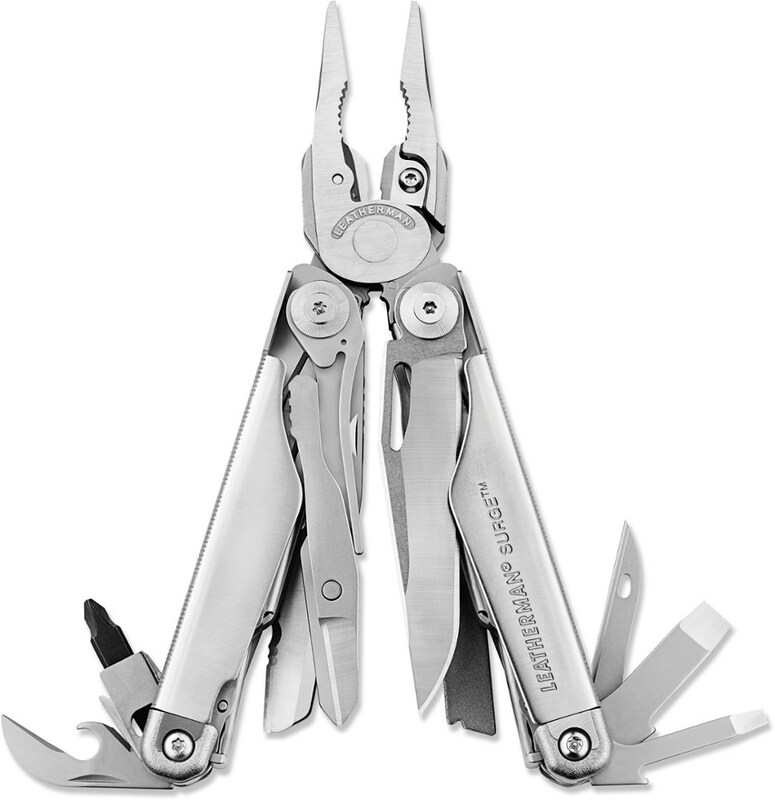 I think the tools are top quality and are almost unbreakable and the best part about Leatherman is that give a lifetime guarantee on all of their products. And they are made in the USA their aren't that many knives made in the USA. I also think the tools are amazing they all have been useful and I don't plan on buying any other multi-tool brand for a long time. I love how the Wave has a saw and all the major tools are on the outside of the tool, and how they all lock in place. The best buy I have made in a long time. The Wave is the best Leatherman I have owned. It is compact and filled with all the essentials. I like to keep anything that might be considered a weapon low key due to local laws. The construction is top notched, and the tools are extremely well made. I use it only for my day hiking adventures, and every single tool has been useful. Anytime I am going on a trip or heading up the mountains, either hiking or mountain biking, the Leatherman Wave goes with me. I have the original Wave, and it has lasted me at least 10 years now, and is still in great shape. This knife is great and I plan on purchasing a new one soon to leave in the car. Great multi-tool. Small enough to pack light, large enough to get the job done. I keep mine with my hiking kit and a separate one in my Jeep. Just in case. A great functional multi-tool. Easy access to the tools you use most on the outside. Many of the other tools I have used place the blades and saws on the inside making it difficult for one handed operation. When you need a blade in a hurry normally you don’t want to fiddle with it getting it open. Just the right tools for the outdoor enthusiast. The serrated blade cuts through climbing rope very easily and the pliers make getting some bent tent stakes straight a snap. After owning several different models of multi-tools, I have come to love my Wave the most. It is a folding type tool, and the outer tools (knives, saws) lock in place which is a very nice feature. The model I have does not allow the inner tools to lock into place, which I would like. The tools are all very useful and the scissors are better than other brands I have used. I only wish that it operated like the original Gerber, so one handed operation would be available. Also I like the leather (full grain) pouch that it came with versus the cloth ones from other brands. Has been very handy many times in my life both in the woods and on my ship (I was in the US Navy). Would definitley reccomend to a friend! I got a 'Wave' right when they first came out a few years ago, and I loved it until the day it got stolen! I tried some other Leathermans, I have a Juice, but nothing filled the void in my heart. So I bought a new one! and once again I am oh so pleased!! One tip though, don't drop it in a super sandy place. 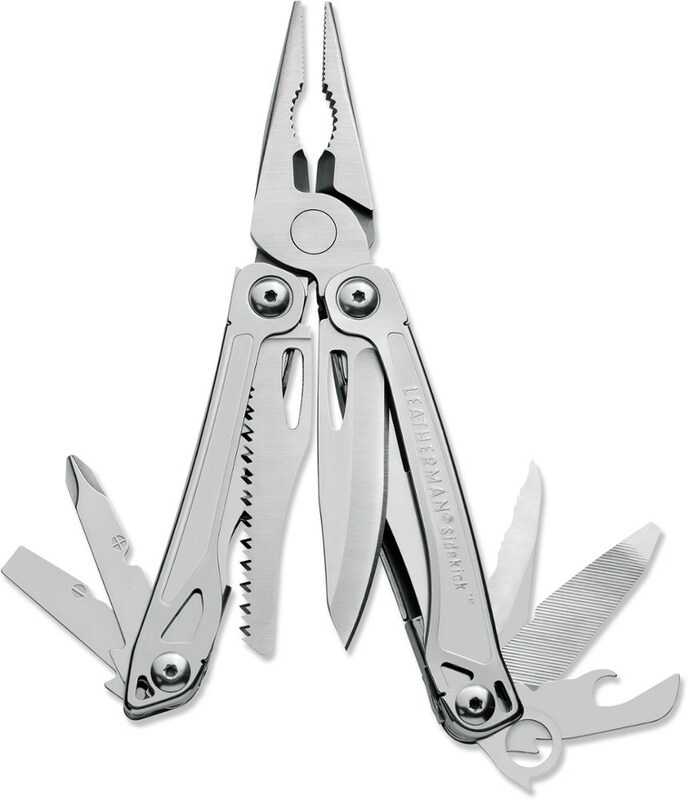 This is the multitool of which all others should be judged. This is a great quality tool. This tool has saved me on more than one occasion. The joint is still tight after a lot of hard use the teeth on the pliers are still in good shape. I really like the fact that the knife locks. This is the best multitool I have ever had in my hands. After great deal of research into a number of multi-tools I finally selected a Leatherman wave with black oxide finish. The black oxide finish helps with the corrosion protection but mostly it makes the tool look cool. I use this primarily during camping and outings as a scout leader. - Very sturdy tool, the players are strong and all blades lock very securely. - The wonder saw works great, I've cut 2 inch diameter branches with it even with the short blade. - The knife blade is a relatively soft stainless steel 420HC. At first this annoyed me because I was hoping for a harder steel. As it turns out the blade provides better corrosion protection than many of the harder SS metals and is easier to keep sharp. - Tool operation is excellent the blades open one-handed and the action is smooth and easy. - All locking mechanisms on the multitool click in nicely, a very secure feeling. - Removable head on the screwdriver is an excellent feature, it allows a variety of different types of heads to be utilized. It's a bit head does wear out you can simply replace it. - Can opener works well. - Rulers stamped into the side can come in handy. - Although the scissors work well they appear pretty flimsy and the way they close could present a cut hazard from the open blade. - The eyeglass screw bit is worthless. when you use the bit you close up the tool this sets the bit off-center from the main axis of the tool that you will be twisting. The result is a completely unusable tool for precision screw. - Do not plan to do long whittling projects with this tool. Although it works well for this, after a while the metal edge of the tool will begin to bite into your hand. It is fine for short projects like sharpening a stick but is not suited for longer projects with extensive whittling. - The larger screwdrivers can be a little awkward to use because when opened it to is off-center of the twisting access. This is a simple limitation of any type of tool of this nature. - The tool is heavy because of its well-made structure. This can be annoying to some while carrying in a pocket. The nylon carrying pouch is larger than it needs to be. Overall a very well made and thought out tool. I take it on all my camping outings, always comes in handy. This tool is a little bit more pricey than some of the Gerber tools but in my opinion it is worth it. Excellent multi-tool. Don't leave home without it. Excellent multi-tool. Don't leave home without it. It goes on every hike with me. Built rugged and tough, never had any problem whatsoever out of it. The optional attachments are great even though I've never had any use for them. Highly recommend.